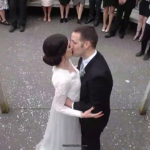 Live-stream your wedding to friends and family, no matter where they are. All they need is an internet connection, all you need is Watch My Wedding. We’ll courier out everything you need – or we can set up and pack down on the day. Start live-streaming your wedding with the push of a single button. Live-stream from almost anywhere in New Zealand using any one of three inbuilt data connections. Our specially-designed video compression algorithm allows for the best user experience. Friends and family watching the live-stream of wedding can now leave a private comment to you in your Electronic Guestbook. After your wedding we print and send out the comments so you can include them in your official Guestbook. * Additional fees apply, must be ordered before the wedding day. There’s no need for special accounts or software to start watching your wedding live-stream. Guests just press Play. The camera we use to run your live-stream measures just 5x10cm – so will barely be seen in your wedding photos. Unlike many live-streaming apps, your wedding ceremony will be broadcast to a private page on our server. Congratulations you two! So glad I was able to watch! Val you look stunning! Love you so, so much! Congratulations … ! We celebrated you guys by watching your wedding on the big screen and eating wedding cake! (well cupcakes)! Best wishes on your wedding day, we love you both. So happy to share in this special day. Congratulations to you both, you are a beautiful couple. It was the most beautiful ceremony. I was so honored to have witnessed it. … made the most gorgeous bride!!! Family and friends overseas who couldn’t make it... loved being able to witness our ceremony remotely. We were so grateful to feel part of the ceremony even though we couldn't make it over there. The result was amazing... Thank you to the team for helping make our special day more memorable! We recommend booking your live-stream service around 6 months before your wedding day, in order to secure availability. Simply choose your options and pay a fully-refundable deposit in order to secure your date. With Watch My Wedding, you can live-stream your wedding to loved ones around the world, via a private webpage.